"Ride Safe and Free - They are Never Forgotten!" If you are a veteran that may or may not be a member of the American Legion and loves the "freedom of the road" on two wheels (and sometimes even three), then check out our site and contact us. We'd love to have you! In the fall of 1993, the original American Legion Riders idea was a shared dream of then Post Commander Bill (Polka) Kaledas and Chuck (Tramp) Dare at Post 396 in Garden City, Michigan. The idea was to start a motorcycle association that would operate within the American Legion. It consisted of members of the American Legion, Auxiliary and Sons of the Legion who shared an interest in motorcycling. It was meant to be a family oriented group just as its parent organization, The American Legion. 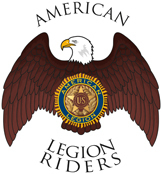 The American Legion Riders is not an M/C, and does not practice M/C rules or regulations. Read more about the history of the American Legion Riders here. Since then, several groups have been formed throughout the country. These American Legion motorcyclist groups all share a common interest...riding. Riding, participating in parades and ceremonies, promoting the mission and image of the American Legion. Also, many of the Wisconsin districts have been instrumental in raising funds for numerous charities, helping to contribute to those in need. Whether it is working together on Veteran's issues, participating in a local parade as a motorcycle color guard, raising monies for a charity or cruising together on a beautiful fall colored highway, the American Legion Riders program has provided a lot of enjoyment for those members who share a common interest in motorcycling.